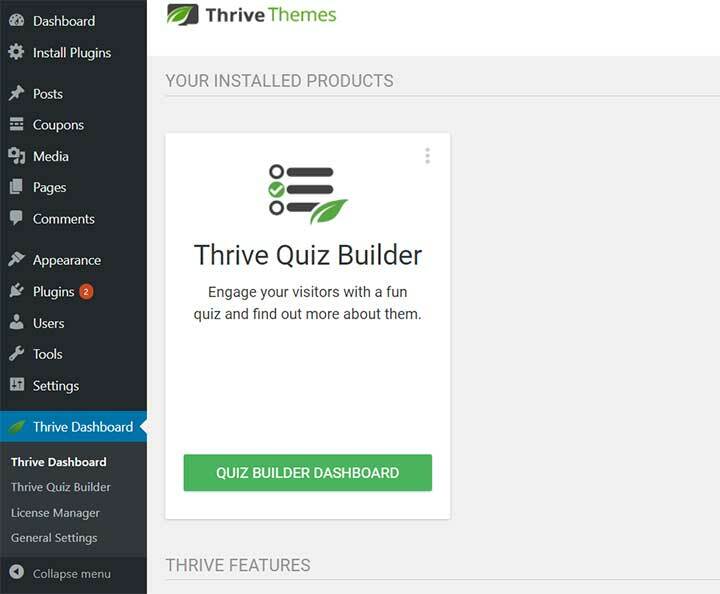 Thrive Quiz Builder comes from the talented team of developers over at ThriveThemes. It is a WordPress plugin which helps you create powerful quizzes for your WordPress website. However, as they blatantly put it on their landing page – “quizzes aren’t just for silly fun”. 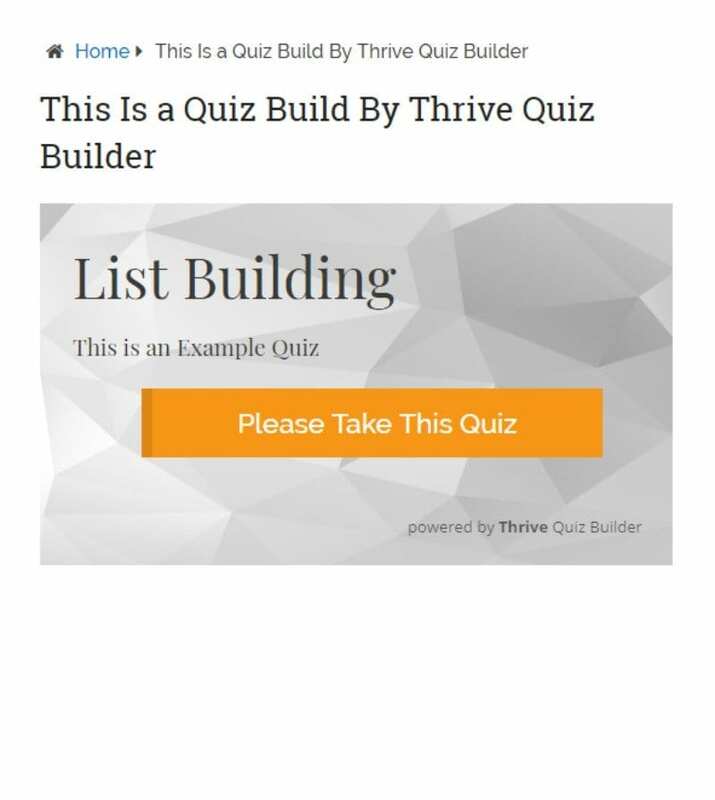 In fact, with Thrive Quiz Builder, and all the feature included within, you can practically use it as a powerful tool to grow your business. 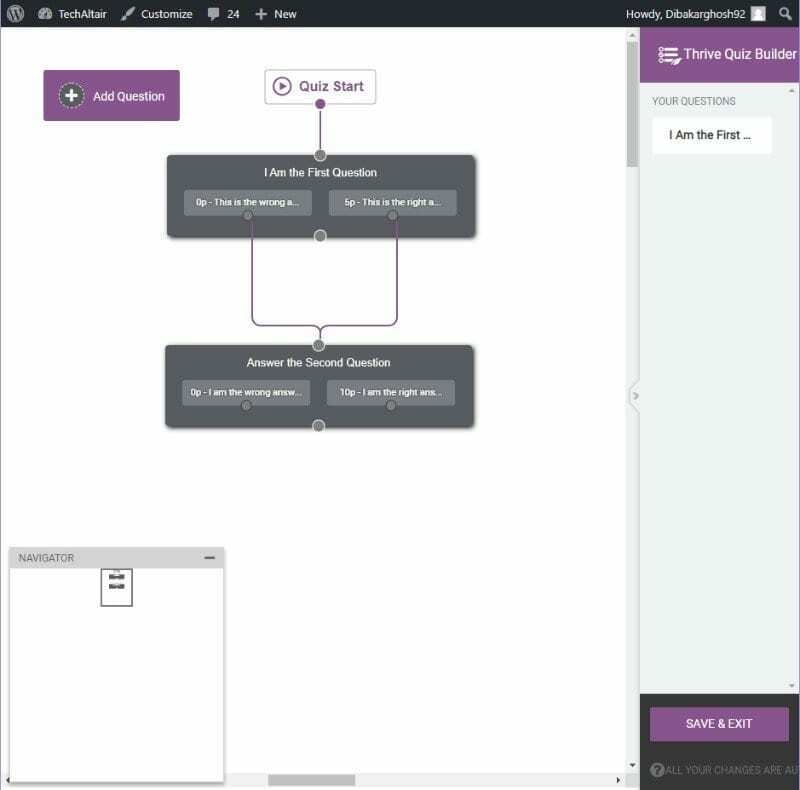 The plugin will give you access to a lot of tools to help you create beautiful and complex quizzes for your website. You can use them to grab the user’s attention. And once you have done that, it is merely a matter of diverting the attention to something fruitful. You can use it to grow your email list, increase social share, and much more. Now, for this read, we will be going over a detailed overview of everything the plugin has to offer. And once you got an idea, we will also guide you through a basic tutorial on how you can create some awesome quizzes with the plugin. 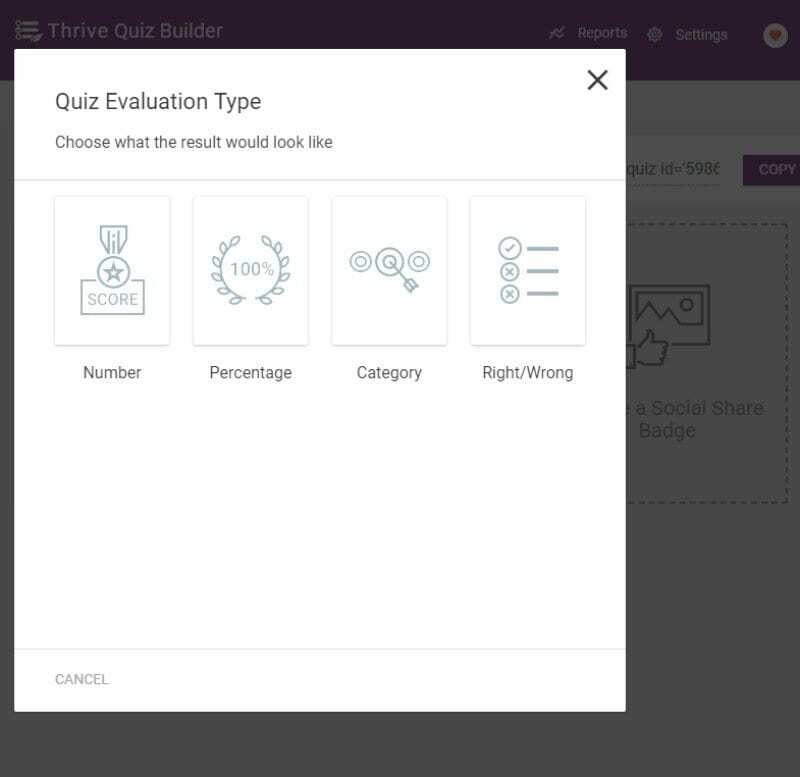 So brace yourself, because we are now diving straight into our full in-depth review & a tutorial for Thrive Quiz Builder. 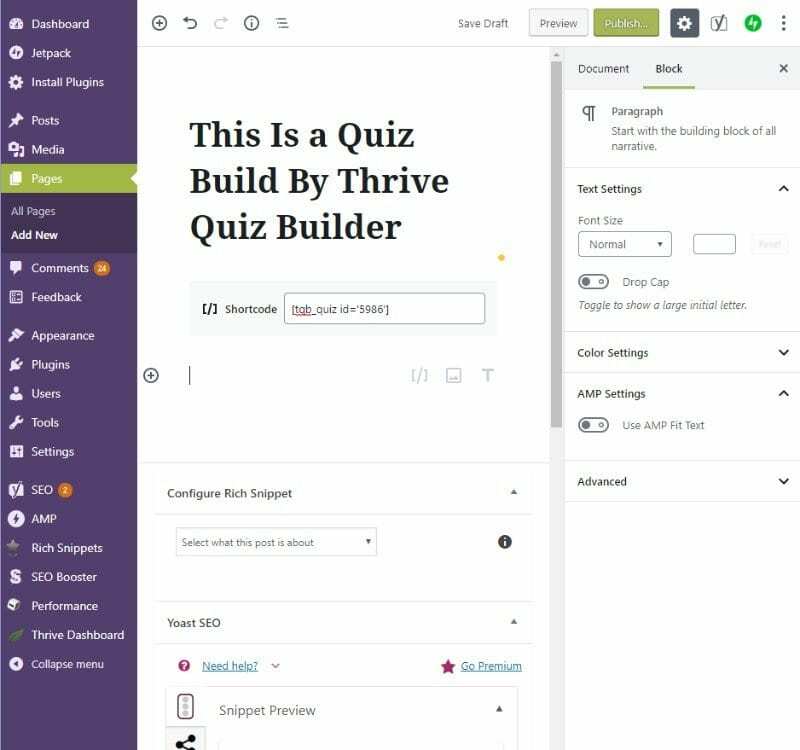 Before talking about how to create powerful and engaging quizzes with the plugin, first let us quickly go over the different features and functionalities it brings to the table. The Number Type: After taking a quiz, the player receives a number as a final result. The Percentage Type: Here the player receives a percentage as the final result after giving the quiz. The Category Type: The player is shown a particular category after they have given the quiz. The Right/Wrong Type: At the end of the quiz, the player will get to see which questions they answered correctly and which ones they didn’t. Using these four different quiz types, you have the option of creating a variety of different quizzes to engage and allure in users. 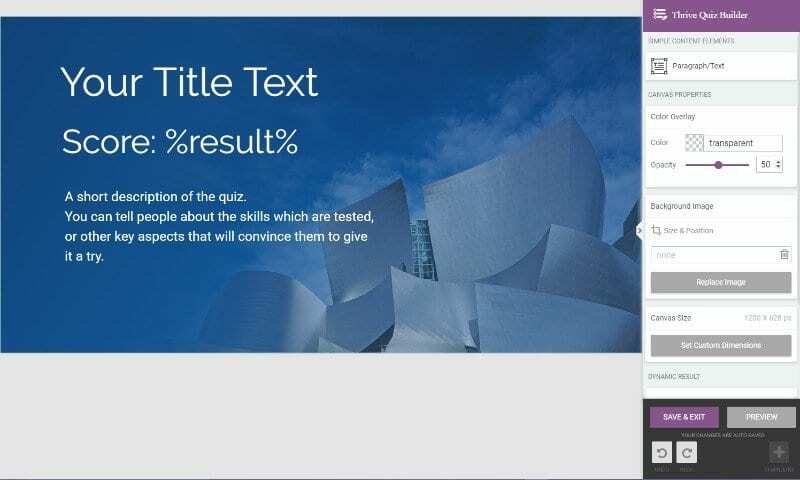 For example, with the percentage type or the number type quizzes, you can create a competitive game for your users, whereas the right/wrong can be used for trivia type quizzes. And the category type can be best used for those popular “which personality are you?” quizzes. Starting Vs. Finishing: Allows you to see how many people are starting to play the quizzes and how many people are finishing them. Quiz Flow: Allows you to see where users are dropping off from engaging with your quizzes any further. Individual Question Stats: Get a glance to see how each question is getting answered. Social Sharing Stats: Analyze which quizzes and which results generated by the quizzes are being shared the most. User Stats: An inside look into the log of how each quiz taker answered each question. Build from scratch: This is preferable for people who have used the plugin some times before. It gives the user access to a clean slate from which they can create their custom quiz without any predefined settings. List Building: Choose this option if your primary objective is to build your email list by using these quizzes. The result page will be locked unless the user signups/subscribes to your site. Social Shares: Choose this option if your primary objective is to increase social shares and help your quizzes go viral over the internet. 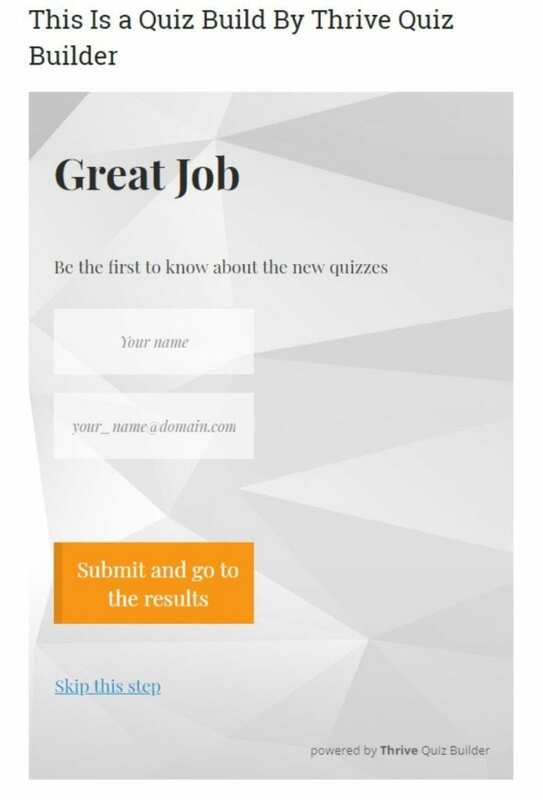 The result page will contain a customizable social share badge which the users can share to show their results in your quiz, and also invite their friends to participate in your quiz. Do note; you are not limited from Social Sharing options if you intended to go with List Building and vice versa. 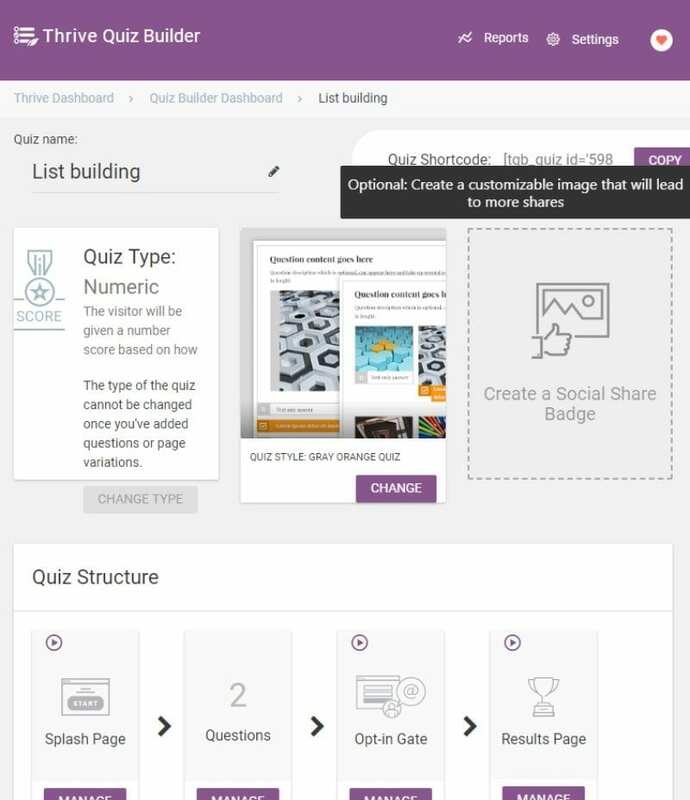 At the end of the quiz building process, you will again to prompted with options that let you choose if you want to enable social share badges on your quiz, even if it is for list building purposes. 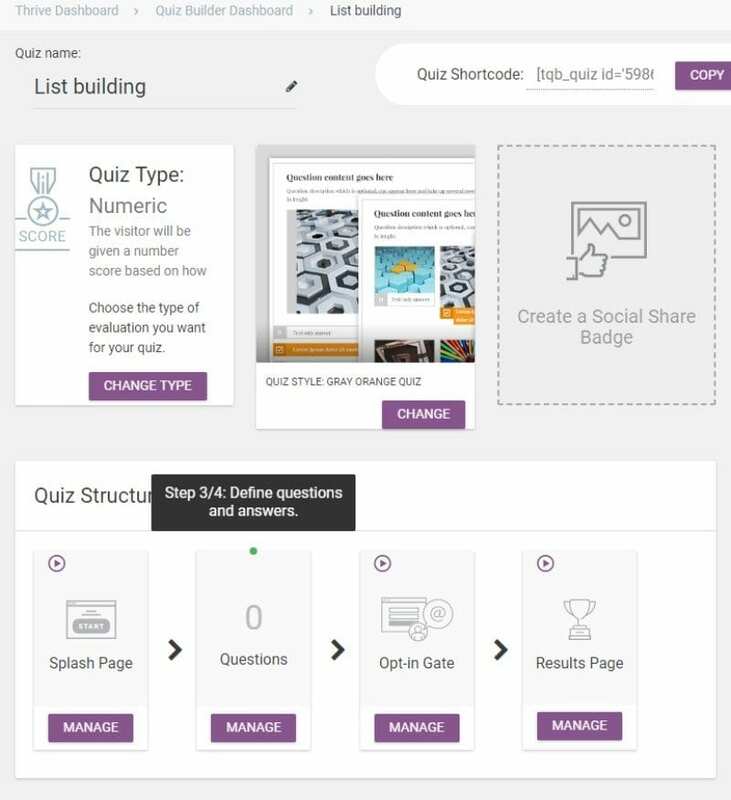 Now to help you build your quizzes, the plugin will give you access to a powerful quiz builder packed with a lot of options intuitively laid out for easy access. 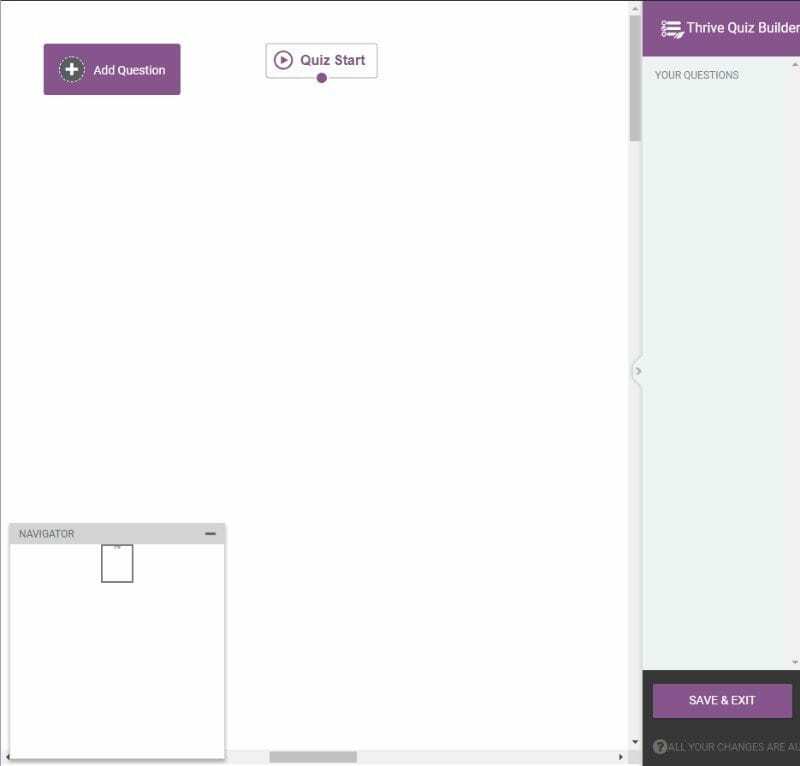 You get access to a custom visual editor to help you create the quizzes using simple drag and drop gestures. You can easily drag and drop the modules to create the answers and questions to your quizzes rather easily. There is also the option to apply complex/conditional logic to your quizzes. For example, you can pick specific questions to show up depending on which answers the user has selected. This is another one of the key functionalities of the plugin. The Badge Editor will give you access to a powerful interface from where you can easily create custom social share badges which users will be attracted and alluded to click and share your quizzes. There is an option to add/resize images, add text, tweak the formatting, set different background colours, change opacity, and even choose tried and tested badges for different social networks. With A/B testing you will get a quantitative understanding of how your quizzes are performing. Two different kinds of A/B testing can be done with the plugin. 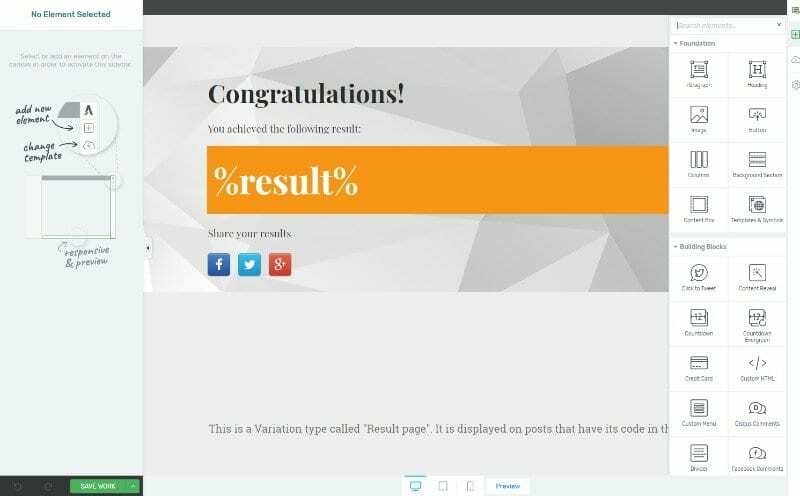 Result Page Testing: Using this functionality, you can easily pinpoint which result page is leading to optimized conversions and social shares. Splash Page Testing: Allows you to determine which splash page is leading to more people taking the quiz. Weighted Questions: Option to assign a numeric value to different text-based answers. It can help determine the final result of a quiz. Dynamic Results: Option to create different results page for different variations of your quiz. Each result page might have different goals – e.g. list building or social sharing. Opt-in Gates: Ask players for their details before they showing them the results to the quizzes. 2 Types of Media: Quizzes can incorporate both texts as well as images. Setup Wizard: Comes with a setup wizard which will alert you if something isn’t configured properly. Quiz Dashboard: Plugin features a custom Dashboard which allows you to see all the quizzes you have created along with basic stats on each quiz. Responsive design: All quizzes are mobile-friendly and will render itself accordingly for small screen devices. 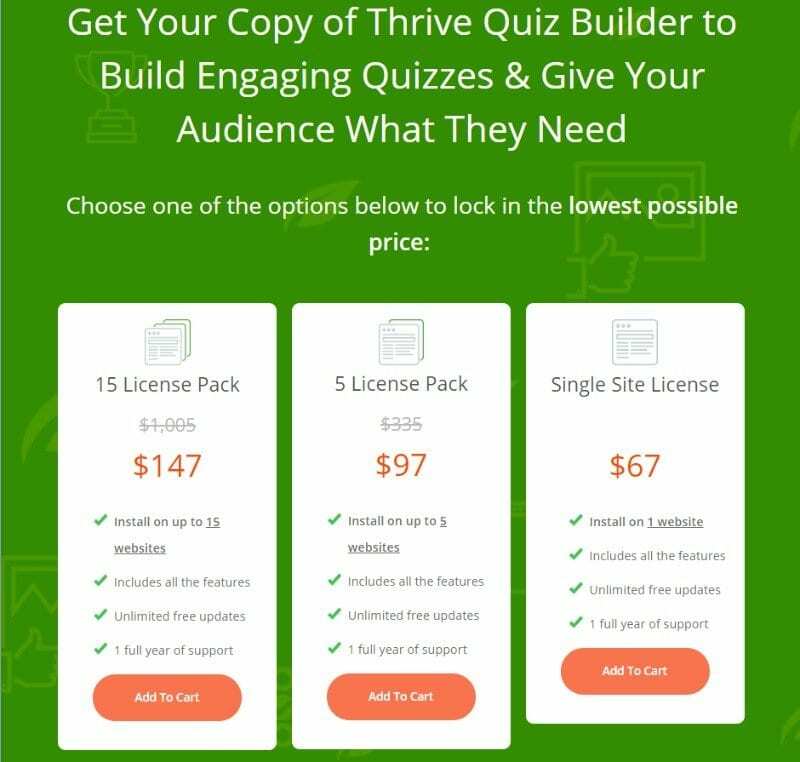 How to Use Thrive Quiz Builder to Create your own Powerful Quizzes? 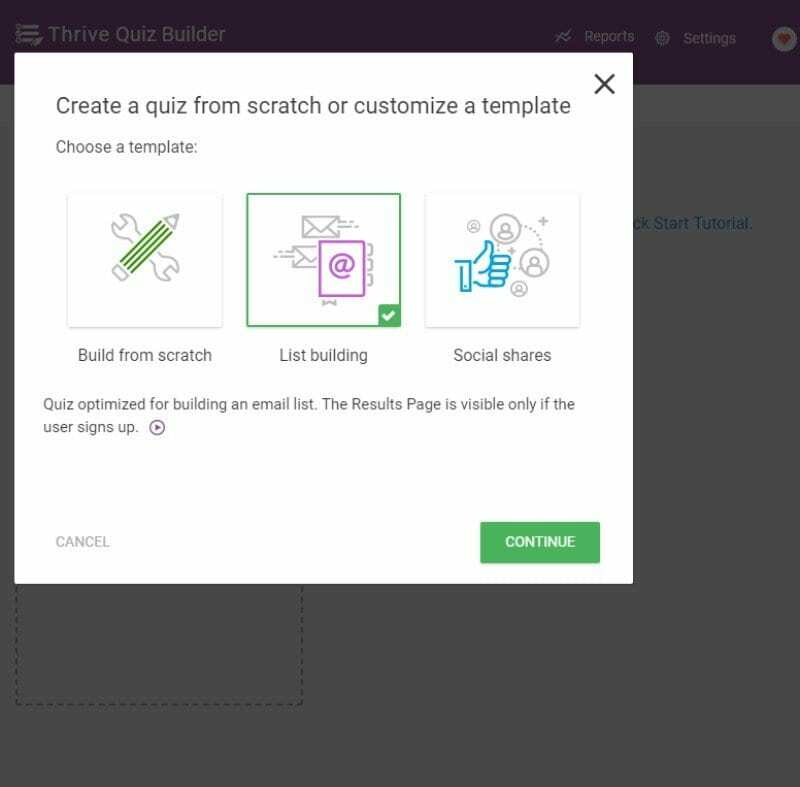 And now that you have an idea of all the bells and whistles of the plugin it is finally time to walk you through on how to create a powerful Quiz using the Thrive Quiz Builder. 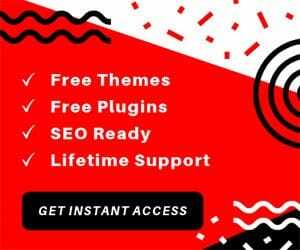 Once you have installed and activated the plugin on your website, you will notice the Thrive Dashboard option show up in the sidebar of your WordPress dashboard. From here you will find four different options: Thrive Dashboard, Thrive Quiz Builder, License Manager, and General Settings. 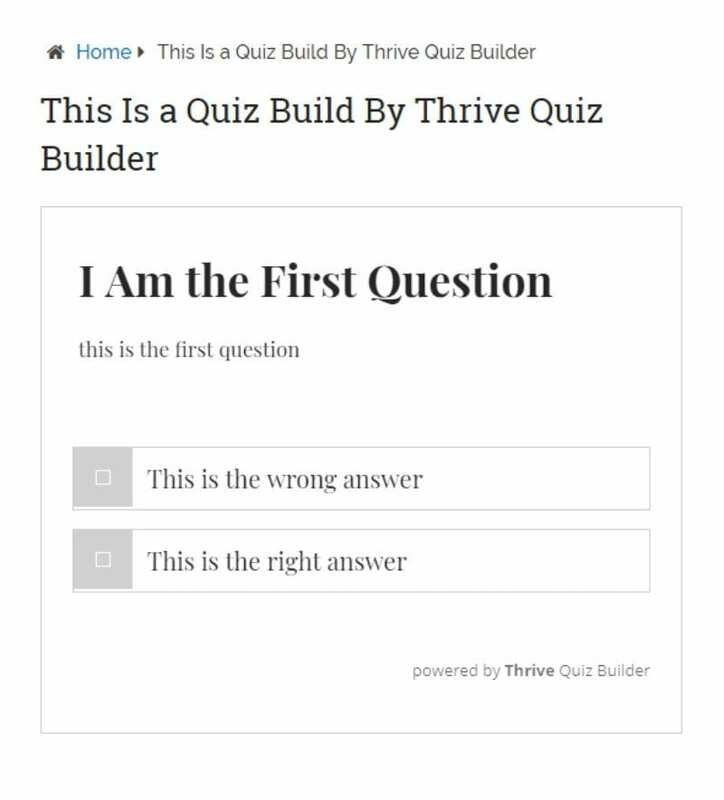 Now to start building your first quiz with the plugin, head on over to the Thrive Quiz Builder option. Here you will find the option to “Add New” quiz, or access all available quizzes if you have previously made any. If this is your first time creating quizzes, the interface will look like this. Once you have clicked on the “Add New” option, this screen should appear on the screen. Choose “Build From Scratch” if you want to create a quiz from the ground up. Or you can use the “list building” or “social share” options depending on what you want the quizzes to do. For this tutorial, we will be going forward with the List building option. Once you have selected the option, choose a name for your quiz and click continue. Once you have selected a name for Quiz, this screen should appear. 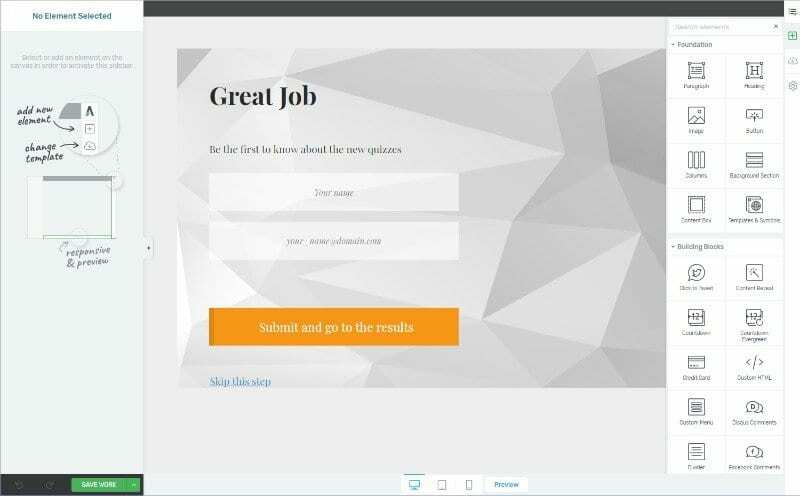 As you can see, from here you can edit the name of your quiz, copy the quiz shortcode to use on your site, and the most important, create/customize the quiz. You will get three options. First, you have to set the quiz type followed by the quiz style, and finally create and attach the social share badge. Here is how to do it. Start by selecting the quiz type. As discussed earlier, you will get the option to choose between number, percentage, category, and right/wrong type. For this tutorial, we will be going forward with the number quiz type. Next, you will have to select the quiz style. Selecting the option will open up a plethora of templates. Pick the one which you like best. Once you have done this, you will find some new options organised below that let you control the quiz structure. The splash page is like the landing page for your quiz – the page users will visit before starting the quiz. From the splash page settings, you can configure your splash page starting from its looks to its functionalities. 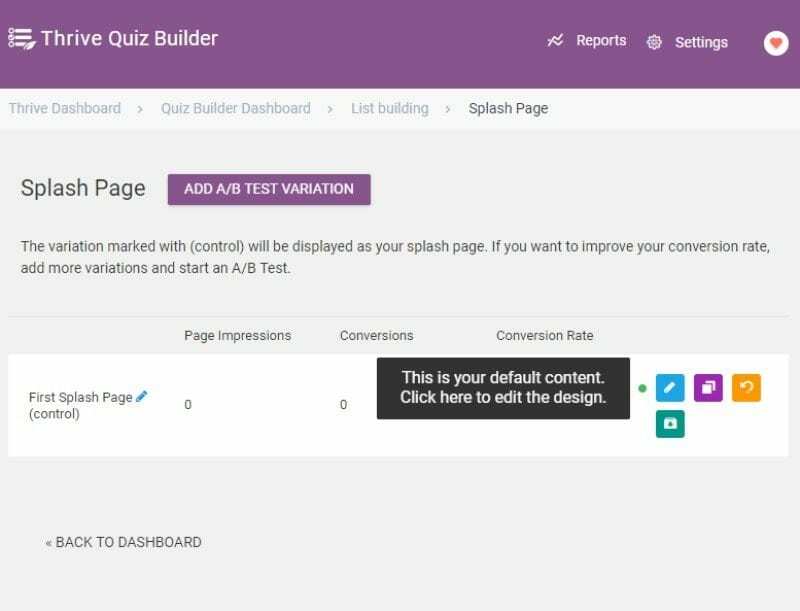 You can even assign two splash pages for one quiz, and A/B test them to evaluate their performance. Once you click on the pen icon, you will be taken to the splash page editor from where you can start creating different quizzes for your website. 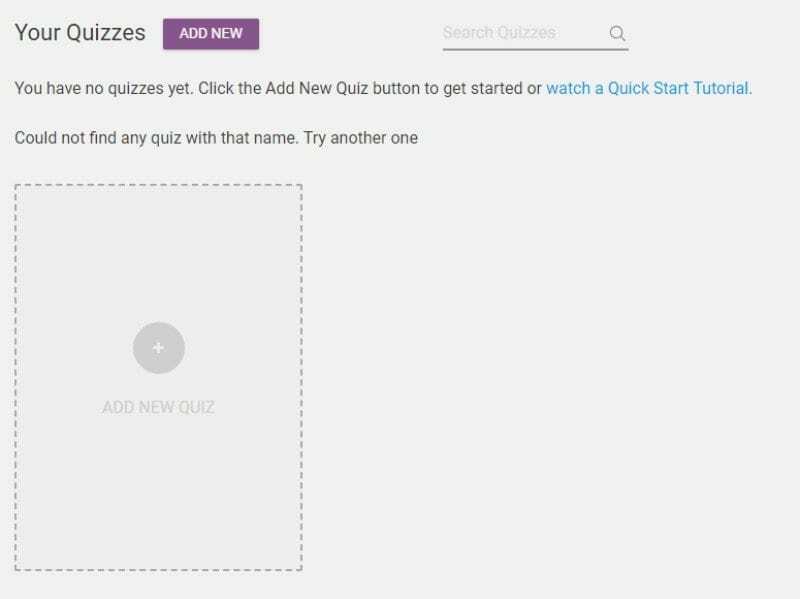 You can select the quiz name, change the description, tweak the text in the “Start Quiz” button, and lots more. As you can see, you will get access to plenty of other design elements as well to help you create a feature-rich splash page if you like. Down below, there is a preview option to see how the splash page will look like in different screen size devices. If you don’t like some aspects, you can use the undo, redo options located to the lower left-hand corner. And if all is right, then it is time to save the Splash Page and start creating questions for your quizzes. 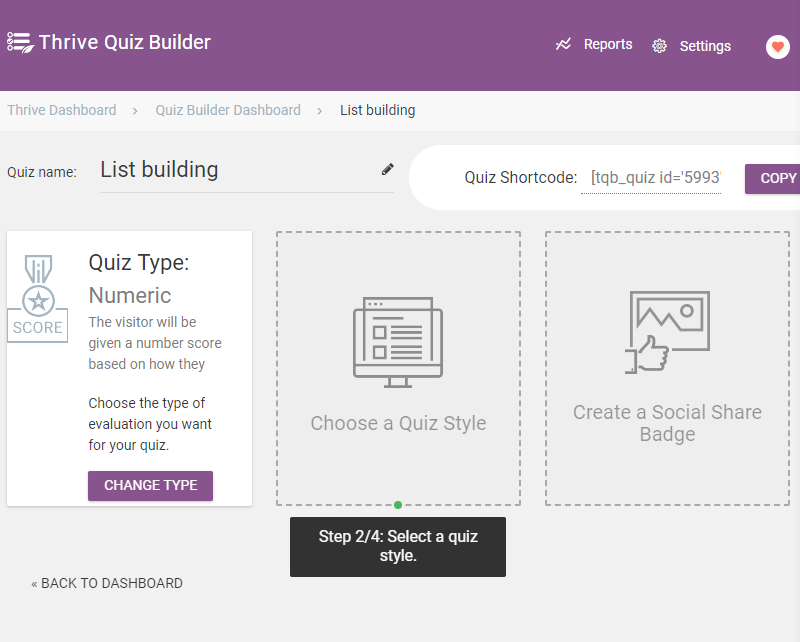 As you can imagine, from the questions tab, you will be taken to a new quiz builder panel, where you can create new questions and add them to your quiz. To add a new question, click on the “Add Question” button. 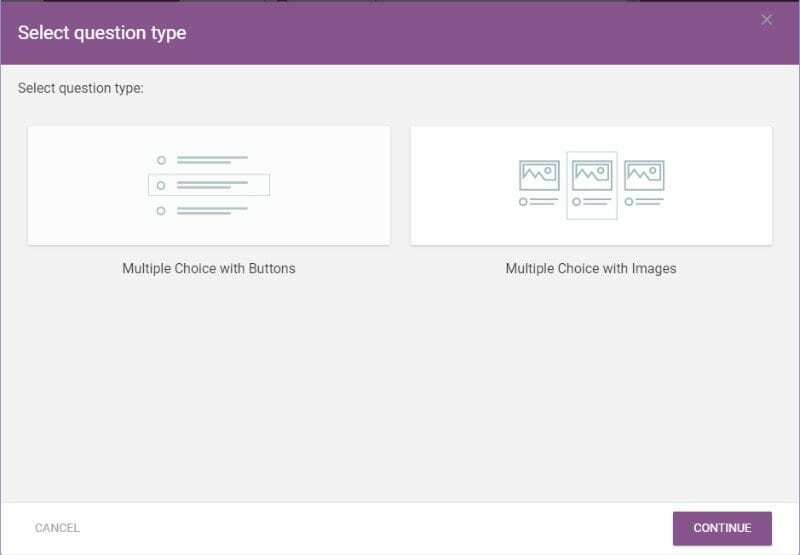 You will get the option to choose between two different question types — a simple Multiple Choice with buttons, or Multiple Choice with images. Here we will be going forward with the first options – multiple choice with buttons. 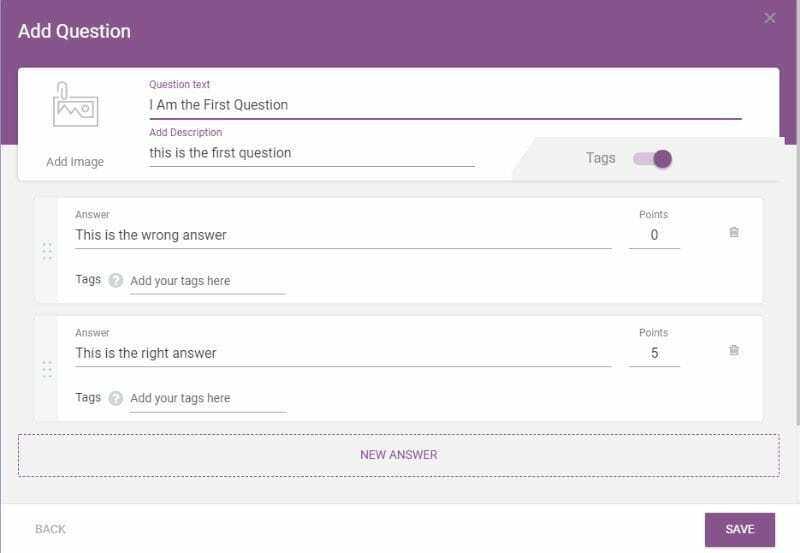 Now a new box will open up where you will be able to create new questions and answers for your quizzes. As you can see, you have the option to add the question text followed by a question description. To the left-hand side, you should notice an option which allows you to add an image to the question. Following this, you can start adding the different answers to the questions along with the points you want to assign to each answer. Now here, as you can see, I have created two questions. Depending on the answers the user picks, they will be taken to the consecutive questions, as shown by the arrows. I can pick different questions to appear in front of the user depending on which answer they have picked for the first questions. And so, you will be able to create some highly complex quiz structure using the platform. For now, we will “save & exit” the screen and go on to our next option. Before showing the results page to your users, you can insert an opt-in page first. Here you can ask the player for their email address and name, which you can use for your list building effort. Creating the opt-in page following the same page builder as you get with results page and splash page with the same options, settings, and functionalities. Now comes the part of creating the results page. Here too, you will be greeted with the same page builder interface as you get with the splash page builder. You will access the same diverse collection of elements to enrich the results page and make it more engaging for your users. This is the end of your quiz when you will be showing how much the user scored, or what the users’ result was at the end of the quiz. This is also the place where you get to add social share badges so that players can share their score with their friends on social media. Not only will this help increase awareness about your brand, but also help drive in more traffic to your quizzes. If you want to create new social share badges for your website, that too can be easily handled following the option provided. But do note that is completely optional, and won’t interfere functionally with your quizzes. Selecting the option will open up new Social Share Badge templates. Let’s consider the “Architectural” template for this guide. 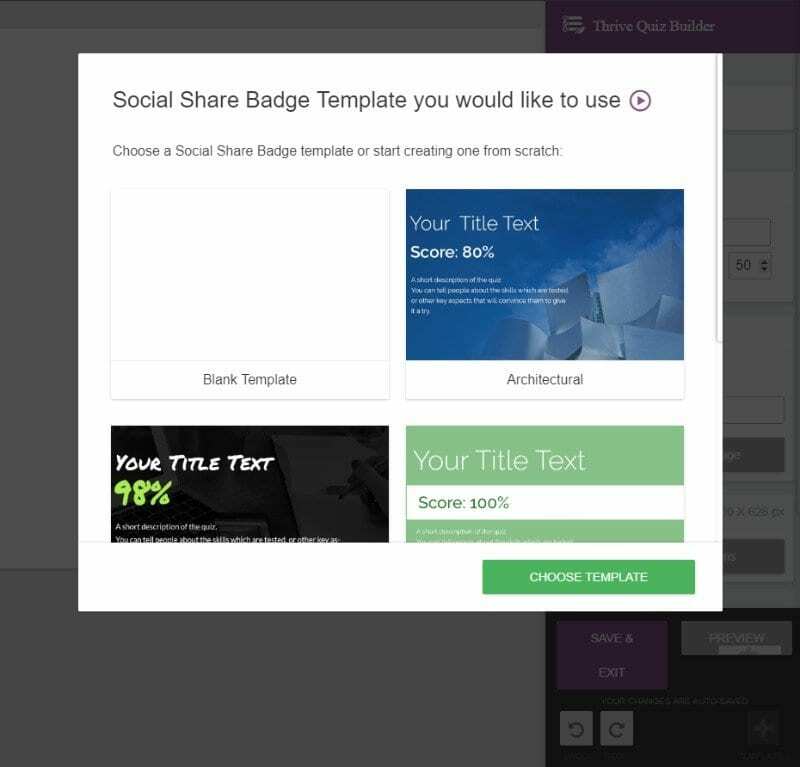 Once you have picked a template, you will get access to the social share badge customizer. The right sidebar consists of multiple options which will help you control the “paragraph/text” for the site, tweak around with the different canvas properties, change background/image, and so on. Once done, you can click on the preview to see what you have created and if you like it then click on Save & Exit. After following all the steps mentioned above, we have successfully created our first quiz using the plugin. Now, all there is left to do is to test it on your website. To do so, we will need to copy the shortcode associated with the quiz. We can paste this shortcode, either in our posts or on a separate webpage. 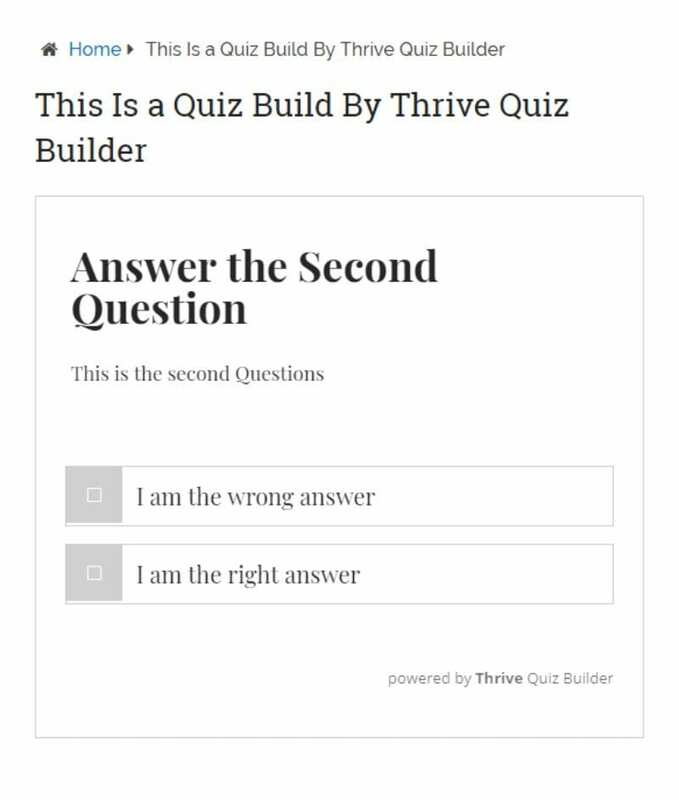 For this example, we are creating a new page “This is a Quiz Build By Thrive Quiz Builder” and pasting the shortcode as the content of the page. Now let’s see how it turns out. So as you can see, with this minimum amount of effort, we were able to create this fantastic-looking quiz in no time at all. Note: For the purpose of this tutorial, we picked the list building quiz structure along with the number quiz type. If you pick something different, then there will be minor differences as you create the quizzes. 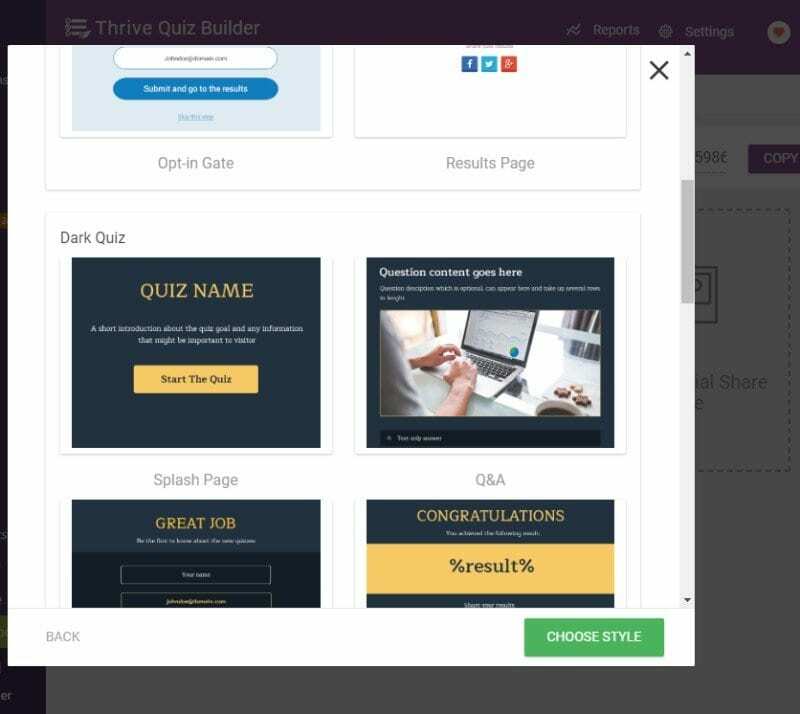 With so many awesome features packed inside a relatively intuitive and easy to use interface, it isn’t confusing that the Thrive Quiz Builder is a premium plugin. You can find it in three different pricing plans based on how many licenses you are looking for. If you want a single license for one website, then it will cost you $67 only. License for five websites is priced at $97. And their final pricing plan of $147 comes with licenses for 15 sites. Each one of these plans will entitle you to unlimited free updates, and one year of free customer support. And of course, if you have any issues with the plugin, you can always get a refund thanks to their 30-day money back guarantee. 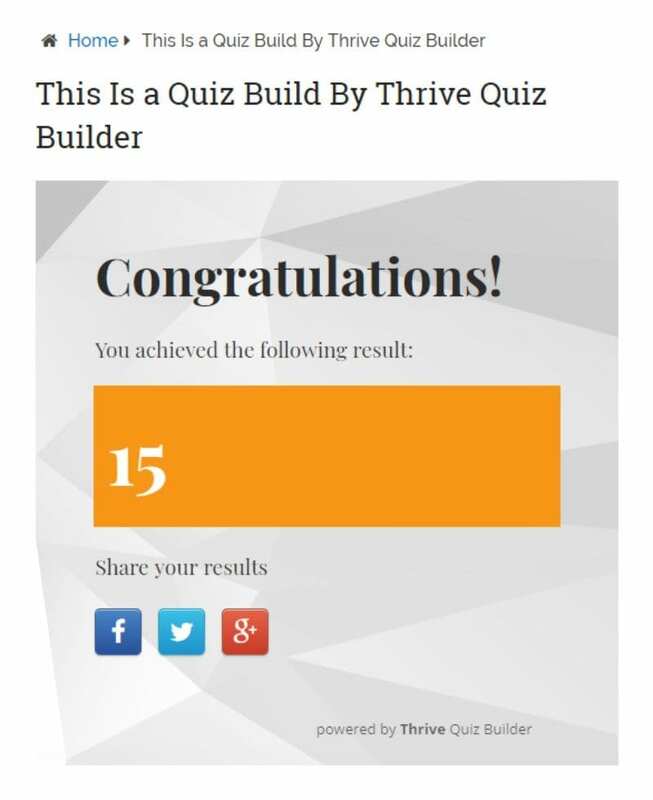 So this has been our full review and tutorial on Thrive Quiz Builder and how to use it. We hope you found this review article helpful, and it solved any issues or problems you have had using the plugin. 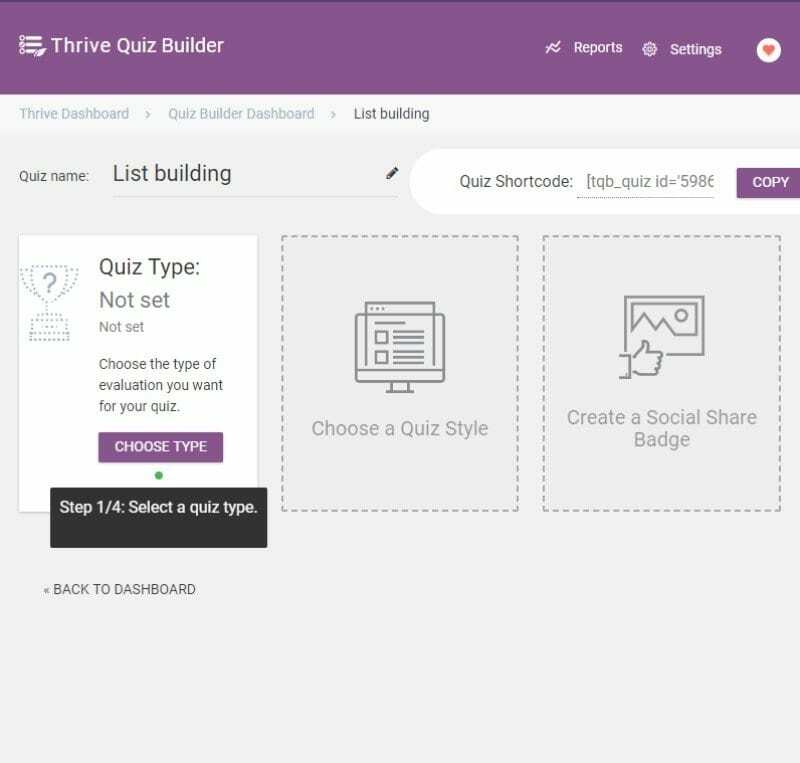 Also, for those people planning to integrate a quiz functionality into their website, as you can see, Thrive Quiz Builder is exceptionally feature-rich, and setting up powerful quizzes isn’t that difficult either. Now, if you have any personal experience using the plugin yourself, then don’t forget to write about it the comments below. We will love to hear from you, and your fellow readers might also find your contribution insightful. 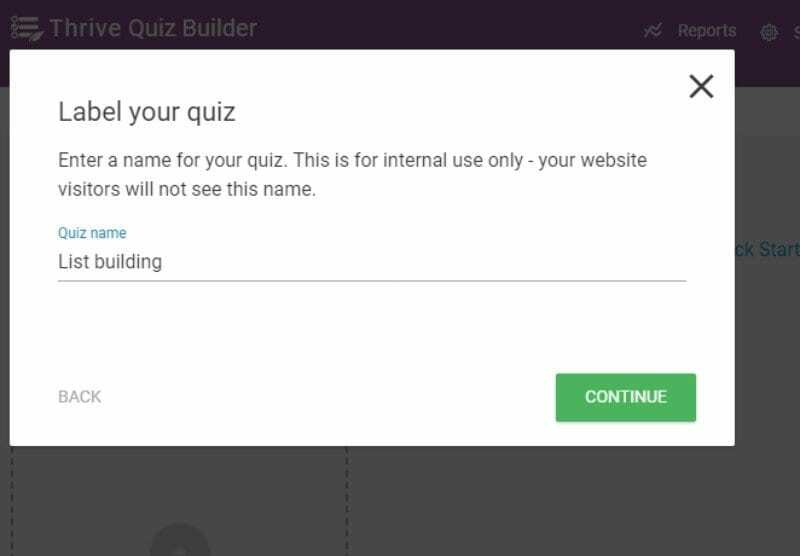 For someone, looking to explore other quiz builder plugin with much simple and ready to use interface, WP Quiz Pro from MyThemeShop could also be a good option. You can read our detailed review about WP Quiz Pro here. 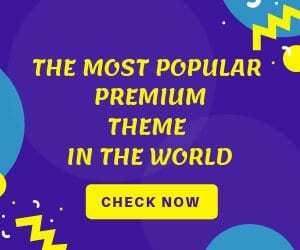 Alternatively, If you love other Thrive Theme products, you can opt for Thrive Themes Membership where you can save up to 24% on yearly packages and you will get access to all the themes and plugins plus the feature release plugins.